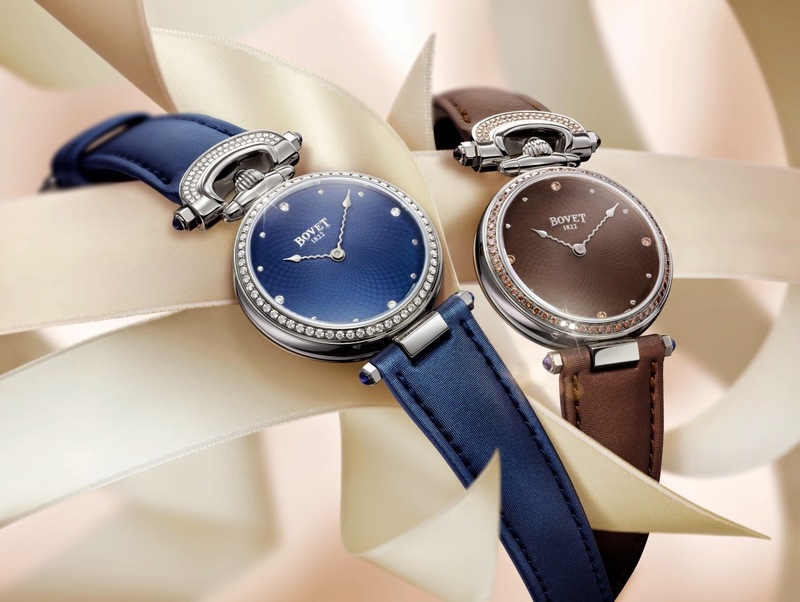 The emblematic Amadeo® Fleurier collection from BOVET 1822 is enhanced this year by the arrival of two new dial colours in blue and brown. More than simply a change in size, this timepiece brings a new face to the legendary Amadeo® collection. The 36mm diameter of this case, available exclusively in stainless steel, was chosen to accommodate the different facets of this exquisite adornment. Introduced in 2010 across the entire Fleurier Collection, the Amadeo® case allows the timepiece to be converted from a wristwatch to a pocket watch, a table clock or a pendant watch without the use of any tools whatsoever. For the “Miss Audrey”, it was necessary to further reduce the required space of the Amadeo® system without compromising its reliability in any way. Therefore, its stability has been proven by a rigorous 15,000 cycle test at the Chronoable independent laboratory. 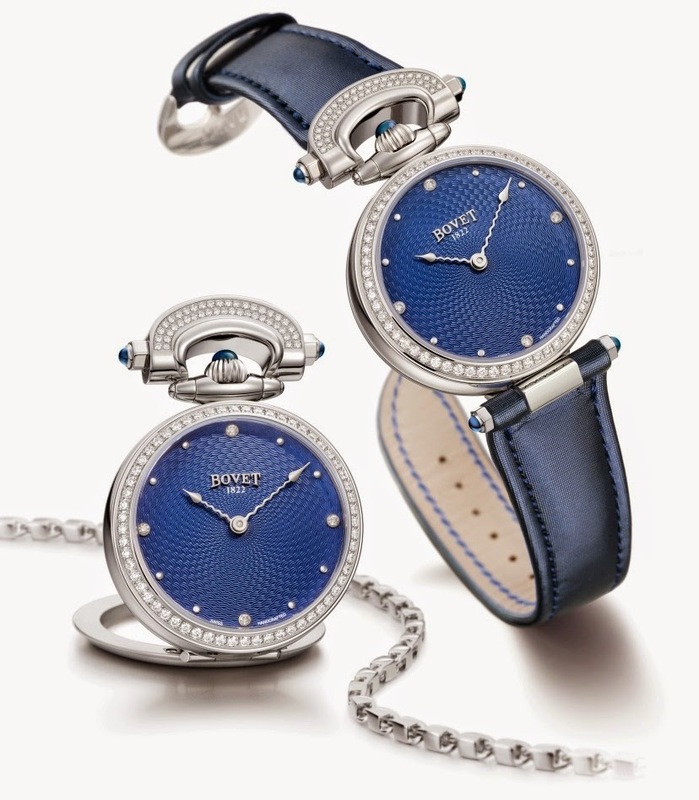 Due to its lower density of steel and its small size, the “Miss Audrey” is the lightest timepiece in the collection which is appreciated when the timepiece is worn as a pendant. The Amadeo® Fleurier “Miss Audrey” is proportionally narrower than other timepieces in the collection, and with this comes added femininity. Despite its thinness, the “Miss Audrey” has sufficient volume to be powered by a self-winding mechanical movement with impeccable timekeeping properties. The guilloche dial of the “Miss Audrey” features the same motif as the mother-of-pearl guilloche dials in the Amadeo® Fleurier Collection. The dials have been lacquered by artisans of DIMIER 1738, Manufacture de Cadrans, to exactly match the shade of the coordinating straps of the timepiece. The four quarters of the dial are interspersed with diamond hour indexes, echoing the delicate setting of the bezel and bow. The steel case-back reprises the guilloche work on the dial. For added elegance and understatement, only two serpentine hands appear on the surface of the dial. The Amadeo® Fleurier “Miss Audrey” comes with a strong synthetic ¬ rubber strap with every appearance of satin, and of course with a necklace allowing the timepiece to be worn as a pendant.